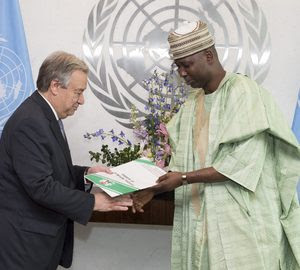 The Correspondent of the News Agency of Nigeria (NAN) reports that Nigeria’s Ambassador/Permanent Representative to the UN, Prof. Tijjani Bande, presided over the 193-member body. NAN reports that Bande’s presidency at the Plenary Meeting happened just nine days after he presented his credentials to the UN Secretary-General António Guterres. Nigeria was appointed one of the 21 Vice Presidents of the General Assembly on June 13, 2016 at the 71st session of the General Assembly. NAN reports that Bande presided over the General Assembly following the absence of the President of the Assembly, Peter Thomson, who was on an official travel to the Central African Republic. NAN also reports that the opportunity for Nigeria to preside over the 193-member body became possible following the assumption of duty of the country’s Permanent Representative. Bande had told NAN that the goodwill Nigeria enjoyed since his assumption of duty last week was an indications that the international community had keenly awaited the appointment of Nigeria’s ambassador and Permanent Representative to the UN more than a year after the last ambassador completed her assignment and returned home. “I intend to leverage on this and continue to leverage on Nigeria’s image in positive light,” Bande said. NAN reports that the 81st Plenary Meeting of the General Assembly under Nigeria’s Acting Presidency, considered three reports. The first report was ‘Appointment of Members of the Advisory Committee on Administrative and Budgetary Question: report of the Fifth Committee’, including the appointment of Mr Olivier Myard of France as a member of the committee from May 11, 2017 to Dec. 31, 2019. The second report was ‘Appointment of Members of the Committee on Contributions: report of the Fifth Committee’, with the appointment of Ms Zhang Wei of China as a member beginning May 11 2017 and ending Dec. 31, 2017. The third report considered was the ‘Organisation of Work, Adoption of the Agenda and Allocation of Items: Appointment of Members of the International Civil Service Commission: report of the Fifth Committee’, with the appointment of Mr Vladimir Storozhev of the Russian Federation as a member effective May 11, 2017 to Dec. 31, 2020. 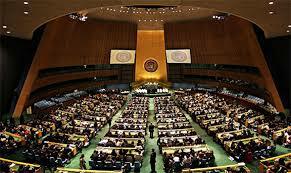 Bande, subsequently, after the consideration of the three reports and recommendations, adjourned the Plenary Meeting.